You can participate in a cute and funny contest! Did I mention winning books? 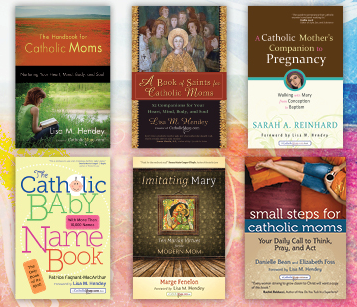 Would you like to win this fabulous collection of Catholic Mom books, each signed by its author? Of course you would. For your chance to win, go to CatholicMom.com and share the funniest (or most effective!) way you manage to get five minutes alone. Because five minutes is all you need to “do” Small Steps for Catholic Moms. You can do this. And you can even win a free copy of the book to get you started, five little minutes at a time. The Small Steps Blog Tour begins today, with the awesome Lisa Schmidt at the Practicing Catholic. Thank you, Lisa! I want to thank our lovely blog hostesses and the very nice folks at CatholicMom.com for organizing this whole tour and being so darned encouraging and supportive as we work to get word out about Small Steps for Catholic Moms. I hope you will participate in the tour, enter to win (multiple ways, multiple days! ), and begin your journey toward a closer relationship with Christ … one small step at a time. 27 comments to Small Steps Blog Tour! for sometime, start with the fundamental i.
maintain a healthy scalp and to reduce product buildup. writing, it’s rare to see a great weblog like thhis one nowadays.. This is very interesting, You aree a very sskilled blogger. I have joined your rss feed and look forward to seeking more of your wonerful post. Also, I’ve sharedd your site in my social networks! hardware. You additionally have a choice of expanding your webbing site host dimension as your demand rises. Sit down while using kids and make fun ids for them. Work with her or him to ensure that this word is being written down correctly. An ancient spaceship discovered on the home planet Kharak holds vital clues regarding the origin of your respective species. Nice response in return of this difficulty with genuine arguments and explaining all on the topic of that. Exceptional post however , I wwas wanting to know if you could write a litte more on this subject? –	Look for someone who lives his life the way you would like to. also there are new elements like Powerful Mech and Sentry Turret.